I've had a busy week getting ready for my team meeting today. 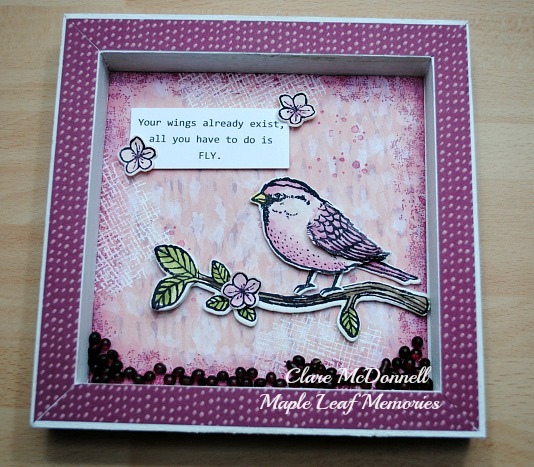 We normally get together one night a month but once a quarter, we spend a full day together, crafting and having fun. 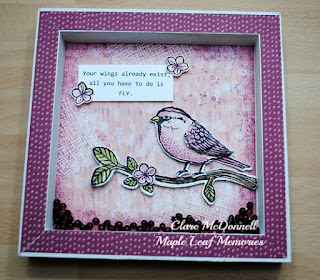 Our main project this month was this little bird frame, featuring the Best Birds stamp set and matching dies. 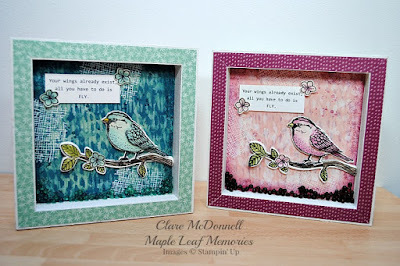 The girls get a goody bag, packed with Stampin' Up products to use on the day and this month's bag included the Blooms and Bliss Designer Series Paper, which has beautiful pink and teal papers, so the girls had a choice of colours for their frame. We stamped and embossed the backround paper for added interest and stamped the bird and branch several times onto watercolour paper before layering them together with dimentionals to create a 3D image. The little coloured beads at the bottom are actually from the bag of silica that came with the frame to absorb moisture, which we coloured with a few drops of reinker and glued to the base. I hope you enjoyed this project, I'm off to watch Northern Ireland take on Wales in the football. Don't forget to use the Hostess Code for June when ordering which is CPRDHP9U and receive a thank you gift from me.